"Not all of the dinosaurs disappeared! On a Pacific island we spotted a female velociraptor and her young. Our mission: To capture the young, alive, or neutralize the mother, who is quick and powerful. The face-to-face encounter will be epic!" In Raptor, each side has access to many different actions and powers. The modular board ensures that each game is unique. A fantastic quick playing tactical 2 player game, which manages not to be too abstract, as it integrates the theme quite well really! One player is the raptor, looking to win by either eating all the scientists or getting 3 babies to safety off the board. The other player is the scientist looking to win by either sedating the mummy with 5x tranquillisers, or capturing 3x babies. Players choose their actions from 9x cards simultaneously, which allow them to take various SPECIAL actions, but the only the player with the lowest number will get to do the SPECIAL actions on the card, the other player will get the difference in actions. The game plays fast, and the 2 sides are very assymetrical and you will need to adopt different strategies in order to win. It can be quite thinky and you may need to plan a couple of moves ahead - I am yet to win! A beautiful production with Vincent Dutrait artwork and good components, including dinosaur and scientist miniatures (all in different poses!). This is definitely up there with my favourite 2 player games. 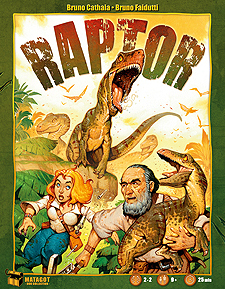 Raptor is a two player game which involves one player playing as the raptor and the other player playing as the scientist. It's a light quick game. The win conditions for the raptor is either eat all of the scientists or get three of the baby raptors off the board. The scientist wins by either capturing three of the five baby raptors or firing at the mummy raptor 5 times. Each player draws a hand of 3 cards and chooses which card to play. Each card has different actions on. The game is very light and quick to learn. The components are really nice the figures are really well made. Its a bargain at this price and I highly recommend getting this game.